The team was tasked to come up with an end-to-end strategic solution that is more in line with today's technology and provide a user-centric experience that's seamless while keeping in-mind Herbalife’s business model of “Multi-Level-Marketing”. The current experience is disjointed between different web properties. Has an inconsistent look and feel. And the product catalog is outdated and doesn’t match the user's expectations. The total scope of this project included; Content Strategy, Information Architecture and UX Strategy, Consolidation of Herbalife Digital Assets, Integration into Abobe Experience Manager. To attract and maintain a community of distributors, creating an environment for conversations between distributors and customers in a personalized online experience that's focused on user weight loss goals. The existing Herbalife Nutrition websites were designed over 10 years ago. As the demand for content and tools increased, so did the pace of Herbalife Nutrition development efforts. Today, these properties drive a significant amount of online traffic and volume, but there are a host of opportunities to improve the digital experience by improving navigation, conversion, reach and growth. Our assessment focused on interviews with stakeholder organizations, North American Marketing, and Distributors as well as a comprehensive assessment of in-class, out-of-class and competitive benchmarks. We interviewed key stakeholders, distributors, and users. Immersed ourselves into existing Herbalife Nutrition research that included “User Diaries” and “Journey Maps”. This exercise helped uncover some common themes that formed our overall thinking for the end-to-end strategy and the basis for the problems we’re trying to solve. What is the customer/business unmet need? Now that we know the problems we’re trying to solve for after immersing ourselves into the health and wellness space. 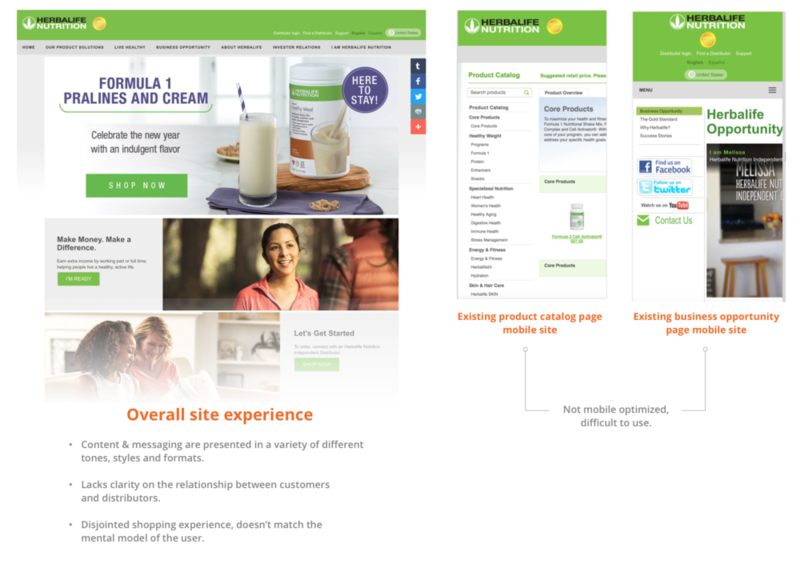 We distilled that research into four UX pillars focused around the strategy of how to enhance Herbalife Nutrition moving forward from a user experience perspective through the prospect, customer, and distributor segment lenses we’ve defined. We looked at the best in and out of class examples of competitors and companies that do a great job at representing these pillars as a way to validate this strategy with stakeholders within the company. 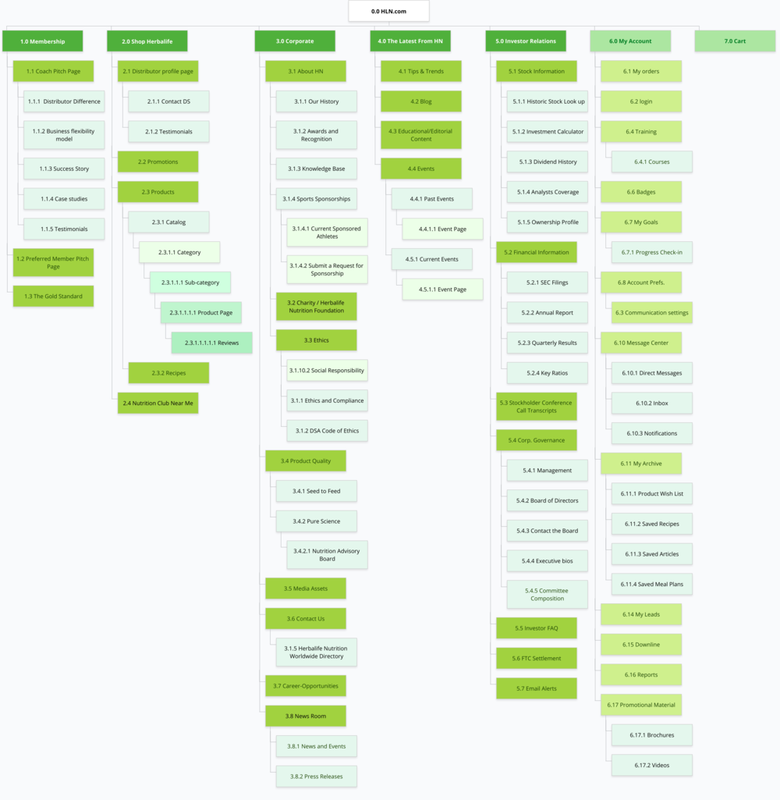 After talking to stakeholders, distributors, users, and diving into the in-class and out-of-class competitors we started to map out the experience using process flows that targeted three key segments; "Prospects, Customers, and Distributors". This helped determine the level of effort from a technology viewpoint and started a dialog over dependencies and in-flight initiatives that are already happening within the company before we spend a lot of time designing the experience. These process flows only represent 2 of the many flows that were created. We conducted a workshop to determine the L.O.E. (level of effort) of the features throughout the experience within each of the process flows. This helped define the feature set based on a technology audit of Herbalife’s digital assets done by our technology partner Hero Digital. An internal card sorting exercise helped define content areas as a springboard into a high-level architecture that maps out areas for the new site content strategy. This is a work in progress. Mobile wireframes were created to help tell the story of the user through the Prospect and Customer lens as they move through two use cases. The prospect entering the experience from an organic search and given several ways to proceed through the funnel. A) Matching users and a distributor with user goals B) Go directly to the product catalog C) randomly pair the user with a distributor. Customer social reorders flow from Facebook with single-click ordering. This is an existing customer who is already signed-in. The goal was to lessen the number of clicks when ordering and get the consumer through the product purchasing funnel quickly.